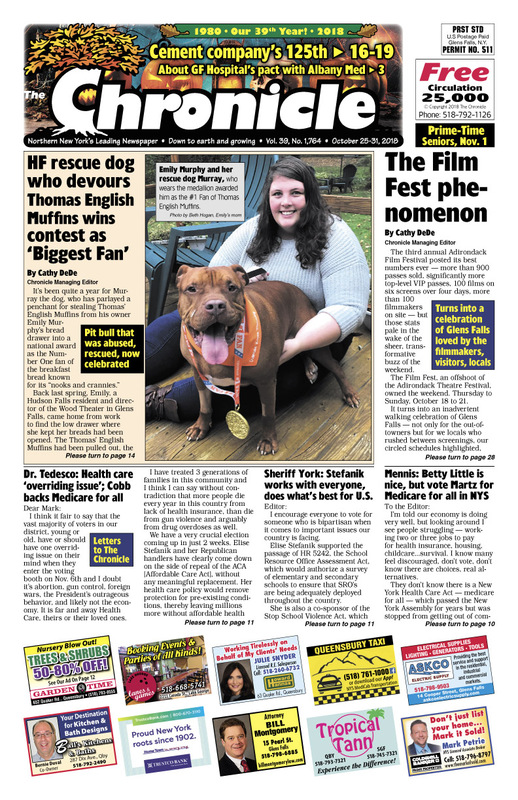 Halloween issue | Hudson Falls rescue dog who devours Thomas English Muffins wins contest as ‘Biggest Fan’. The Film Fest phenomenon. Cement company’s 125th. About GF Hospital’s pact with Albany Med. Delaney Silvernell moves ahead via ‘steal’ by Adam Levine on ‘The Voice’. Ireland trip and photos. Election letters. Pages of real estate listings… Find your dream home! Concerts, comedy, shows… The Chronicle always has the region’s best Arts & Entertainment section!